Mokave’s King Yuma at 15 months of age. Photo copyright Nora Scolin. Please see Mokave Jag Cats Breed Info for the story of this rare new breed of large hybrid cat. Hi Nora… thanks for introducing me to the Mokave Jag Cat. I would like briefly, if I may to try and summarize this cat breed on this page. People can visit your website for more details. Please leave a comment if you wish to add or adjust. This is a cat breed in development, the process having commenced in 2000. It is a wildcat hybrid originally carefully combining the genes of the Asian leopard cat, the jungle cat (Felis Chaus) and the Bobcat with the domestic cat with the intention of creating a miniature jaguar. The overall appearance is a reflection of the jaguar, one of the big cats whose range is in Central and South America. 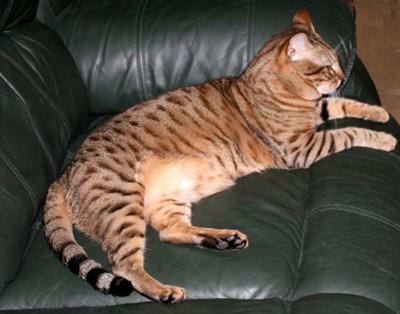 This has been achieved by selective breeding of: Highland Lynx, Desert Lynx, jungle cat and Asian leopard cat hybrids. The resultant domestic cat is large and substantial, weighing up to 28 pounds, with a long lifespan of between fifteen to twenty years. The Mokave Jag Cat has a wide range of coat colours including the classic rosetted (spotted) wild cat look and also including snows, classic tabbies and black, which I presume to be a melanistic coat. The classic eye colour is emerald green or gold. The eye colour changes as the cat matures. Temperament is excellent: friendly and intelligent. See the Mokave Jag Breed Standard (opens in a new window). This entry was posted in Cat Breeds and tagged cat breeds, Domestic cat breeds, mokave jag cat, pictures of cat breeds, unusual cat breeds by Michael Broad. Bookmark the permalink.